As the official member publication of NBAA, this bimonthly magazine includes operational tips and tools, regulatory hot topics, featured member profiles and the latest industry news that affects NBAA members and their businesses. 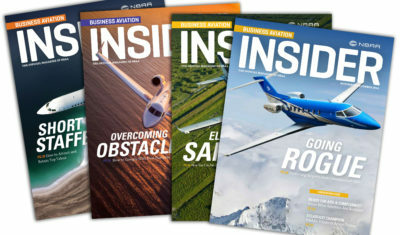 NBAA is the premier source for news and information about the Association and the industry that it serves, and routinely provides Members with relevant, valuable and timely information on the latest operational, regulatory and legislative news, as well as information on upcoming industry events. NBAA Flight Plan is a regular podcast with news and information about the business aviation community for people on the go. NBAA's Flight Plan focuses on the latest operational, regulatory and legislative news, and what it means for the companies of all sizes, all across the U.S., that rely on business aviation to succeed. The NBAA Business Aviation Fact Book offers a clear and thorough presentation of the broad scope and value of the business aviation industry, with real-world information and data about its value to citizens, companies and communities across the country. NBAA's Annual Report highlights Association activity and industry developments each year, and provides an independent auditor’s report and financial statements.